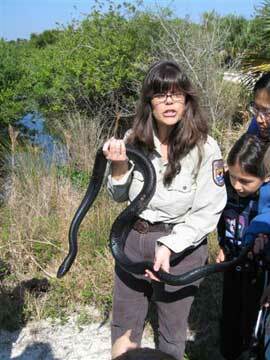 Environmental education is one of the primary objectives of the National Wildlife Refuge System. Merritt Island NWR is an excellent place to bring a class to conduct hands-on environmental education activities and programs. Seven distinct habitat types are found at the refuge and more than 500 species of wildlife make the refuge their home. It is a premier area for viewing wildlife, habitat diversity and natural processes. The refuge staff in cooperation with the refuge Friend's group, the Merritt Island Wildlife Association (MIWA), recognized the need to expand the refuge education program. MIWA received a generous gift from the Sendler family and in October 2002, the Sendler Education Outpost was dedicated for the purpose of providing a facility for environmental education. In addition to the Sendler Education Outpost, the refuge has a visitor center, five hiking trails, two wildlife drives, two observation towers, and a manatee observation deck. Access to the refuge property and facilities are free. To better plan your visit, whether it is a self-guided or guided program, the refuge staff encourages teachers to make reservations. The difference between making your field trip a powerful learning experience depends on how well you and your students are prepared. An excellent way to prepare for a field trip is to visit the refuge prior to your class trip. There are many seasonal changes; therefore, it is best to visit during the same time of year as your planned trip. Free teacher orientation packets are available to aid in your trip preparation. The following information will provide you with a description of the facilities, services available, and contact information. 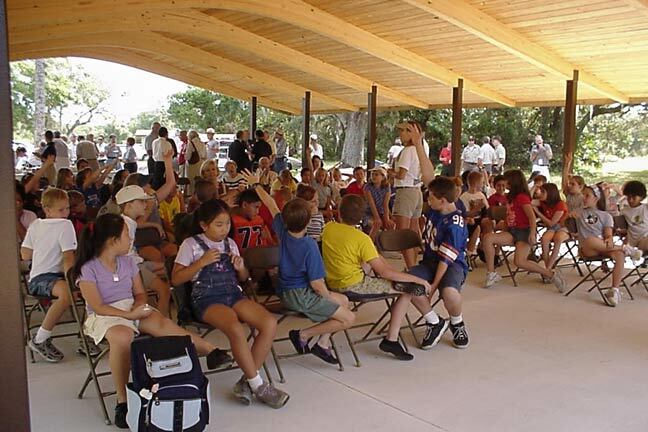 Sendler Education Outpost is a pavilion-style structure specifically designed for hosting environmental education programs. Its close proximity to the Indian River Lagoon and several other habitats make it an ideal location for conducting field-orientated activities including marine studies such as seining and water quality testing and habitat comparison studies. 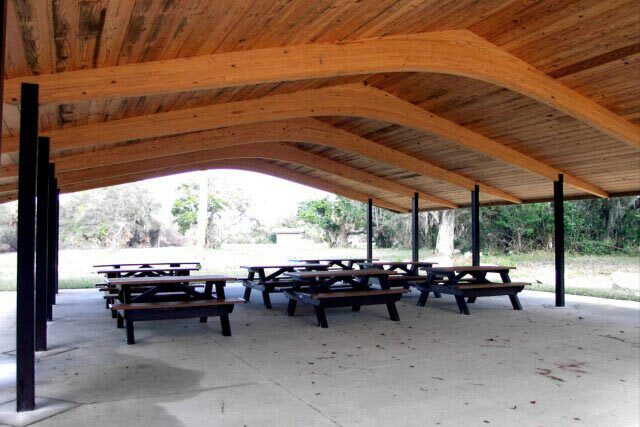 The sheltered pavilion has ample space for conducting class activities and also has picnic tables and rest-room facilities. Click on picture to view a larger image. Use the BACK button of your Browser to return. This program is appropriate for ages 3rd grade and older. The students will be guided by refuge staff or volunteers along our 1/4 mile boardwalk to explore a hammock and freshwater pond habitats. Students will investigate the physical and living parts of these two environments by making observations and using field equipment: microscopes, dip nets, field guides, binoculars, thermometers, and secchi disks. Students will compare and contrast the habitat types. This program is geared for younger children ages K-3 - 2.5 hours. 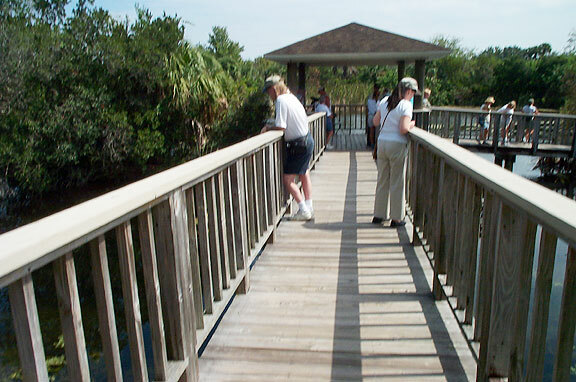 Take a walk guided by one of our volunteers along our 1/4 mile boardwalk. Learn about the National Wildlife Refuge system and the native plants and animals. 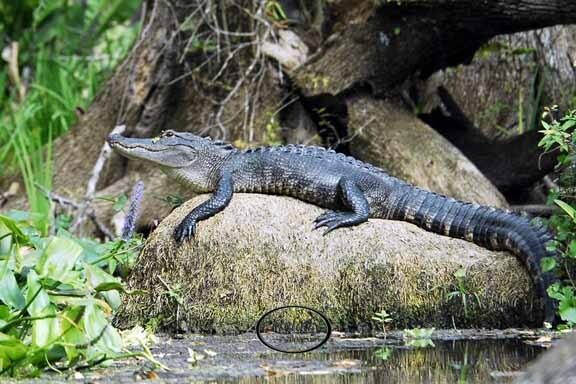 You might see birds, turtles, alligators and armadillos. This informal tour leads you from a freshwater pond through a hardwood hammock ecosystem. Program keys in on observation skills and the basics of habitat. Appropriate for 3rd grade through adults. 2-3 hours. Join one of our expert volunteer birders for an overview on how to bird watch. They will explain how to use binoculars, how to identify different birds, and describe migration habits and adaptations of the different species. An indoor presentation will be followed by a field session where the students will be able to borrow binoculars, spotting scopes and field guides to practice their skills. Appropriate for K through adults. 2-3 hours. See a power point presentation on the West Indian Manatee (a.k.a. the Florida Manatee) then take a drive out to the manatee observation deck to view live manatees in their natural habitat and record scientific data. End your visit with a trip to the Sendler Education Outpost to play an interactive field game that reviews manatee migration and the threats facing them. 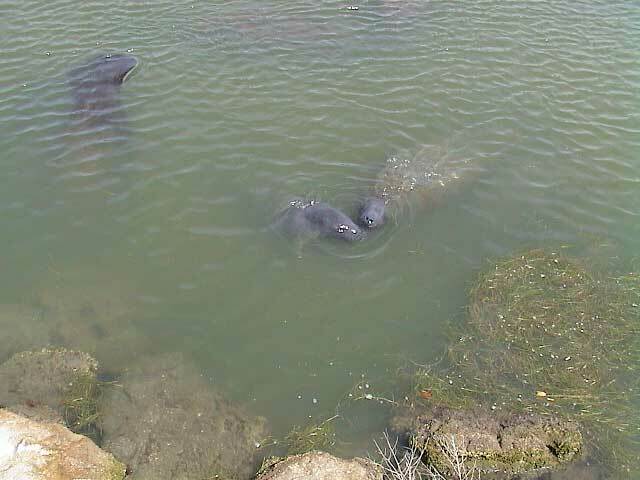 Manatees on the refuge are wild animals and are not guaranteed to be at the observation deck. During the colder months, (December - February), manatees are less likely to be observed at the refuge. Groups may elect to take only 1 part of this program or combine it with use of the Manatee Treasure Box. The Manatee Treasure Box is a free outreach program filled with a variety of manatee related activities, crafts and games. The Florida Fish and Wildlife Conservation Commission developed this outreach tool to educate the public about the natural history and conservation of the West Indian Manatee. This program is designed for use in the classroom (public, private and home-school). The treasure box includes lesson plans for students' prek-8 grade that are correlated to the Florida Sunshine State Standards. The kit includes CDs, books, puppets, art projects, activity books, maps, and posters and much more. The treasure box is housed at the Merritt Island National Wildlife. You can borrow the treasure box for two weeks with the possibility of an extension. In additions, groups can elect to go on a refuge volunteer or teacher guided field trip to the refuge to see manatees in the wild. Appropriate for K-5th (must be accompanied by adults). 2-3 hours. This program can also be adapted for use with 5th grade through adults. Learn about endangered and threatened sea turtles by touching real shells, stuffed specimen, skulls and other materials. Participants will play an interactive field game that teaches the difficulties of living as a sea turtle then make a sea turtle craft. Sea turtle nesting season starts in May and continues through September. Learn how we can help protect these beautiful reptiles. Live animals are not included as part of this program. Appropriate for 4th grade through adults. 3 hours. 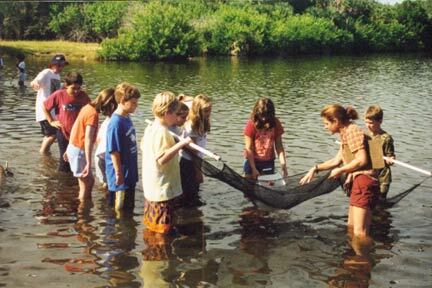 Students will work in teams of four and use a seine net to catch fish, plants and invertebrates in the Indian River Lagoon. Students will use field guides and hand lenses to observe the different species before returning them to the water. Participants will get wet up to their upper legs. 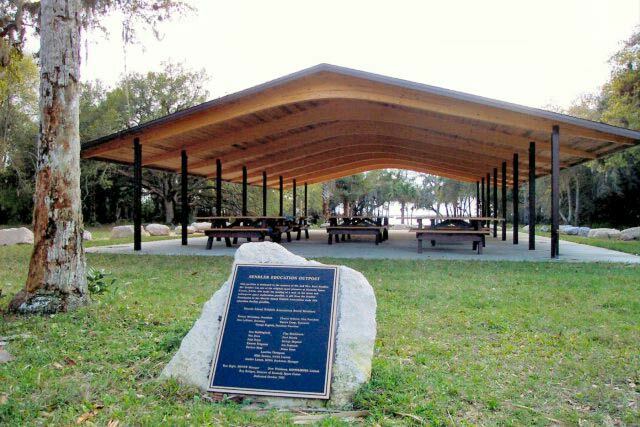 This program takes place in the lagoon next to the Sendler Education Outpost which is a covered pavilion with picnic tables, faucets for rinsing and restrooms. Equipment available: seine nets, dip nets, discovery scopes, field guides, and buckets. This program is appropriate for students in 4th grade and older. Water quality activities can be done separately or in conjunction with the seining activity. Students will learn about the physical parameters of the lagoon by performing the following tests: salinity, pH, temperature and turbidity. The program will emphasize the changes humans can make to these factors that can be detrimental to the Indian River Lagoon' plant and wildlife. Equipment available: thermometer, hydrometer, pH paper, and turbidity tubes. The Way of the Right Whale is a free outreach program focusing on the highly endangered right whale. The Florida Fish and Wildlife Conservation Commission developed this outreach tool to educate the public about the natural history and conservation of the Right Whale which migrates along Florida's East coast. This program is designed for use in the classroom (public, private, scouts and home-school). The treasure box includes lesson plans for students in grades 1-8 grade, teacher guides, books, activities, maps, videos and posters. The treasure box is housed at the Merritt Island National Wildlife. You can borrow the treasure box for two weeks with the possibility of an extension. Field equipment including binoculars, field guides, water quality testing materials, hand lenses, discovery scopes, microscopes, and seine nets are available for loan to teachers. A refundable deposit is required. For information regarding any of the programs listed, please contact Ranger Nancy Corona at the Merritt Island National Wildlife Refuge. Students and teachers are encouraged to visit the visitor center to receive an orientation to the refuge. Interactive wildlife and habitat exhibits, maps and brochures, and educational videos about the refuge and the U.S. Fish and Wildlife Service are available for viewing upon request. Also located at the center is a nature orientated bookstore which stocks environmental educational materials. 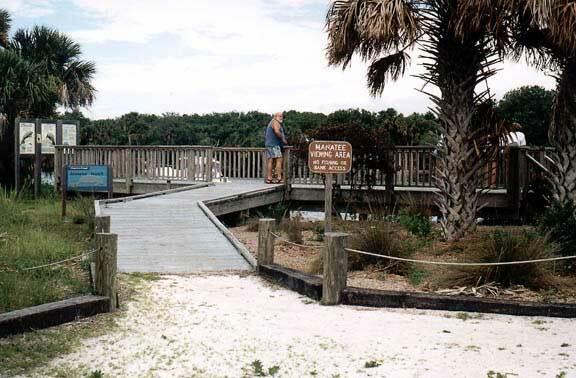 A 1/4-mile handicap-accessible boardwalk adjacent to the center offers great views of a freshwater pond and hammock habitats and associated wildlife. A. Wildlife Refuge Management at Kennedy Space Center is a 20-minute introductory video of the refuge. It is appropriate for children in grades 4 and higher. It describes the mission of the refuge, as well as, the refuge's habitats and wildlife diversity. An overview of the resource management program describes fire and habitat management and mosquito and exotic species control. Footage of the refuge habitats and wildlife make it an interesting, educational, and entertaining video. B. America's National Wildlife Refuge System, Where Wildlife Comes First is an 11-minute film that is appropriate for children in kindergarten to 3rd grade, but it is also appropriate for older children and adults. Wildlife plays the starring role in this video that describes the U.S. Fish and Wildlife Refuge mission and the role that our National Wildlife Refuges play in conserving our natural resources. The engaging views of wildlife and their habitats will help educate and keep young children entertained. The refuge offers a number of outdoor facilities and trails which are great places for students to explore interact and enjoy the natural world. The following describes the outdoor facilities and trails available for school trips. share a common parking lot and are located one mile from the visitor center. 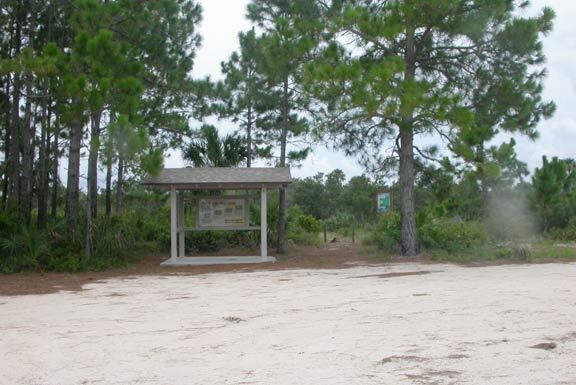 Oak Hammock is a 3/4 mile trail posted with interpretive signs that explain the ecology of the hammock community. 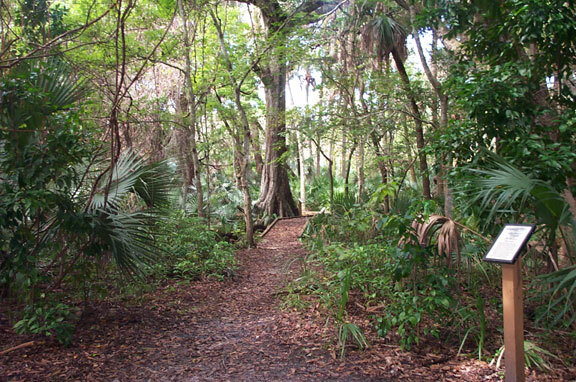 Palm Hammock Trail is a two-mile walking loop. Located on SR 3, is a one-mile loop through scrub habitat. Interpretive displays explain the importance of this habitat and the role of fire in Florida's ecosystems. 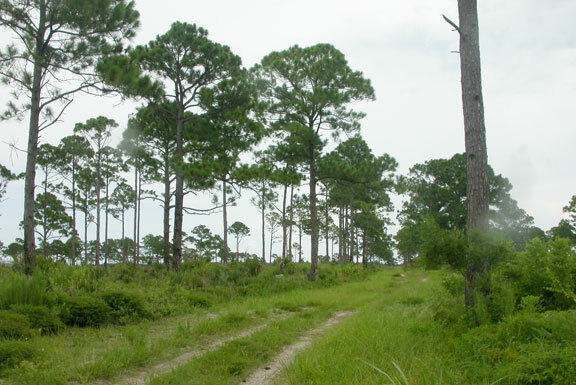 The refuge has a new hiking trail - July, 1007, a 1 mile hiking loop called the Pine Flatwood Hiking Trail. It is located north of Haulover Canal on the east side of SR 3.
is a 6-mile one-way drive through salt and freshwater marshes and it is a great place for viewing wildlife. A self-guided brochure is available that describes the habitat, wildlife and management of the area. There are a number of interpretive signs along the way. Passenger vans and cars are permitted. However, due to safety issues, full size buses and vehicles over 29 feet and 2.5 tons are not permitted on the Drive. 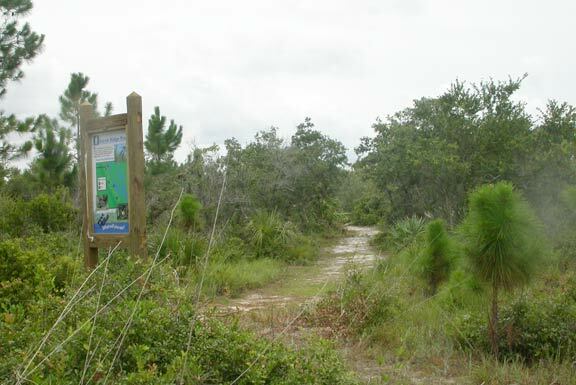 Wild Bird Trail is a 1/4 mile trail located at Stop 3 of Black Point Wildlife Drive. Two wildlife observation blinds provide views of different marsh habitats. Midway along the drive is a parking lot which provides access to the Cruickshank Trail, a five-mile walking loop around a marsh. Restrooms are located in the parking lot. Two observation towers, one with hicapped access, with viewing scopes viewing tower offer grand overlooks of the surrounding area are within a short walk of the trailhead. is a five-mile two-way road that separates Mosquito Lagoon from an impounded marsh. It is an excellent area to observe wildlife, particularly alligators and birds, and to compare natural and managed water systems. is located just north of the Haulover Canal, north of the Sendler Education Outpost. The Observation Deck frequently offers close views of these endangered animals. share a common parking area at the west entrance. They are located along State Road 406. 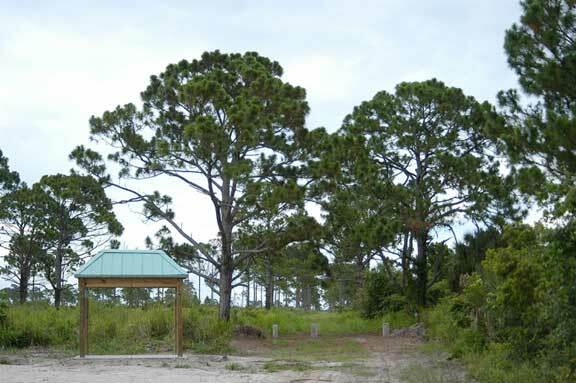 The kiosk contains informational displays and brochures and the observation tower overlooks an impoundment providing wildlife viewing. The refuge staff is ready to assist you in making your field trip an educational, fun and exciting experience. We hope you enjoy Merritt Island National Wildlife Refuge! EYES ON PAGE is what you seek when promoting your business or activity. In 2017 the webpages of the NBBD were visited 1,078,946 times - that averages 2,956 times a day. Won't some of them be seeking what you offer? The style of the NBBD is classic, much like Wickipedia and CraigsList, only more colorful and responsive to our community and your needs. For as little as $120 a year you can be found here!